Leading Lincolnshire Law Company, Hodgkinsons Solicitors, has created an eye-opening infographic as part of Make a Will Month, showing exactly what happens to a person’s property when they die without leaving a valid will in place. The intestacy flowchart shows who is eligible to inherit and how property is distributed. This has been created to raise awareness among the two thirds of adults across the region who do not currently have a will in place and to encourage them to take action. 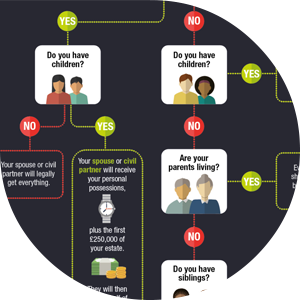 Click here to view the intestacy flowchart. Throughout May, Hodgkinsons is supporting St Barnabas Hospice by writing wills in return for a donation to the charity, as part of Make a Will Month. “Many people assume that their assets will automatically be passed on to those to whom they are closest. The reality is that their estate will be carved up in accordance with strict intestacy rules, determining exactly who is eligible to inherit. “For many people, especially those who are unmarried and those who have step-children, this means that their partners and chosen loved ones can miss out entirely, causing financial hardship, unnecessary division and conflict. St Barnabas Hospice, which this year celebrates its 35th anniversary, relies on fundraising and donations to meet its £4million annual running costs. Hodgkinsons’ will experts are providing their expertise and time free of charge, and money raised will go directly to support the charity, which provides specialist palliative care to patients in Lincolnshire. For further information about making a will with Hodgkinsons Solicitors in aid of St Barnabas Hospice, please submit an online enquiry form or call 01754 897150.